The world around us is constantly changing. Everywhere we turn we are bombarded with news natural disasters, political agendas, and tragedies. It feels like a never ending cycle, especially with social media constantly at our fingertips. So, how do we get up every day, go to work, take care of our homes, and be productive members of our community and not let all of the negativity of our world affect us? How can we be expected to leave all of the sadness that we are surrounded with to be agents of change and a safe place for our guests to come and be greeted with warmth, hope, and love? The answer, I truly believe, is self care. Self care has been such an important part of my process of being a social worker. How can we be expected to take care of other people in a helping profession if we are not taking care of ourselves? 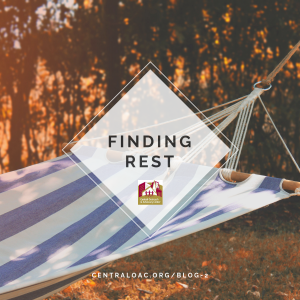 It is so important that we make sure that we are doing things that allow us time to rest – whatever that may look like for us, and it’s going to look different for everyone. Whether it’s reading, writing, exercise, listening to music, going to therapy, or simply being quiet, we need to make sure that we are practicing self care in order to be our best selves. As a team, the OAC staff are reading a book by Wayne Muller called, “Sabbath: Finding Rest, Renewal, and Delight in our Busy Lives”. The book explains how important it is to take time for ourselves, while also giving examples of some ways to practice self care. Some of the examples he gives include: preparing a meal with family, practicing silence and just “being” in your environment, lighting candles and read a book, or taking a weekend to unplug from everything and spend time with ones you love. If we are able to try to incorporate one of these practices into our daily lives and allow ourselves the emotional and mental rest we need then we can do a better job of being the light in someone else’s life.